This is my brother Brian, who I saw over Thanksgiving. And this is his glove - which has been made conveniently smartphone-friendly by his dog, Wally, chewing through one of the glove's fingertips. Almost all modern smartphones use capacitive touchscreens, which are great for light-touch dragging and multitouch gestures but which don't respond to gloved fingers. Sure, there are phone-friendly gloves for sale out there, which include special capacitive-triggering materials in the tips or simple chopped tips just like this (but intentional). 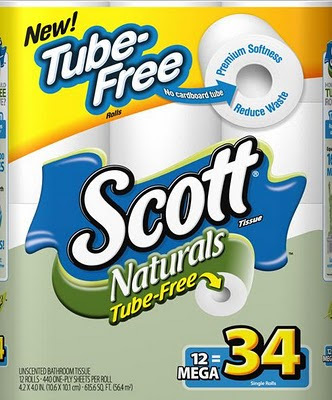 But hey, why buy those when man's best friend can do the job for ya? Universal Wrapping Paper - Silver! I recently had to wrap a gift for a person and occasion that I didn't know (a buyer requested a gift-wrapped Nautilus bottle opener), and had this problem: all of my wrapping paper seems to be themed. That is, it's "birthday" or "baby shower" or "winter" or "Christmas" - no all-purpose, generic wrapping paper! (I ended up using a red-and-green paper that didn't look too Christmassy.) And then I saw this advice from Erin on Unclutterer: use silver. And it's true, there's no situation that I can think of where silver won't work - and it can even be themed with ribbon color choice, like red/green for Christmas or pastel colors for babies. Sounds like a very usable supply to keep around! 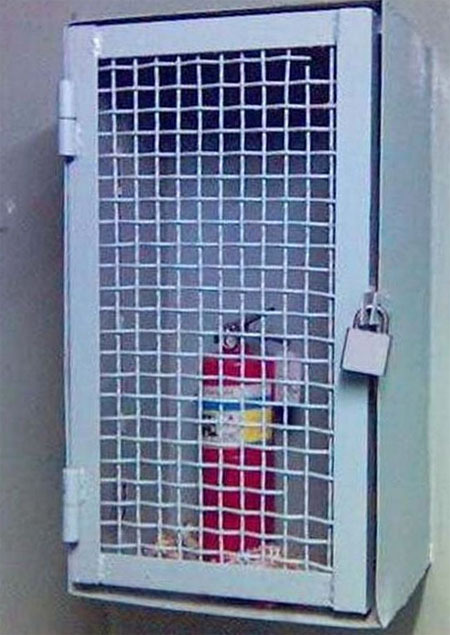 Here's a stunning photo that turned up from "Oscar" on Gizmodo - and as shocking (and funny) as it may be, it's possible to follow the train of thought that resulted in this caged extinguisher. 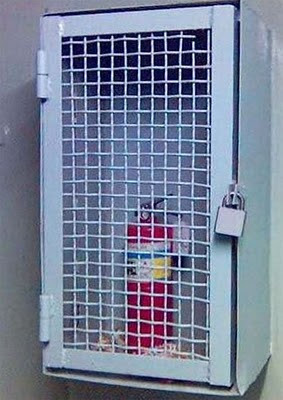 The fire extinguisher is required in the building, sure; but then a building manager notices that it just gets stolen, or used for pranks. Or maybe someone broke the glass, and he said "I'm not cleaning that up again, let's just replace it with wire mesh." Either way, the possibility of actual fire isn't what's on the guy's mind - and it becomes a secondary goal, and eventually gets blocked entirely. The sad thing is that something like this could very well go completely unnoticed - until you really need it! I find designs for small spaces to often be both clever and usable - who knows, maybe it comes from my history of camping and backpacking, or time in small dorm rooms and apartments. 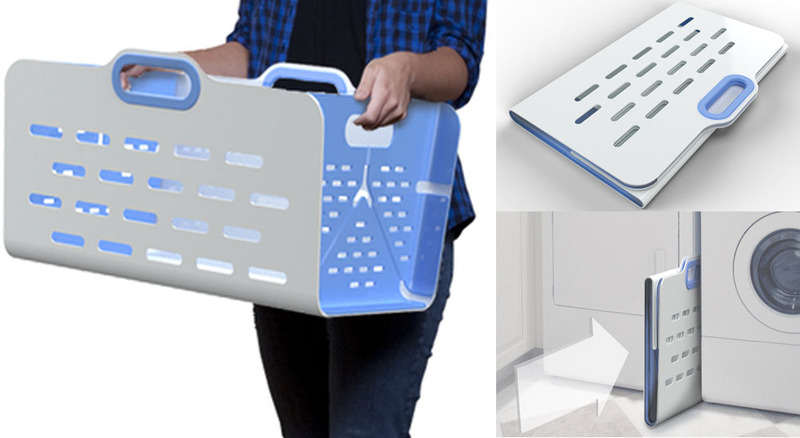 So, here's one that appeals to me: Quirky's UnHampered, a folding laundry basket designed to fit between laundry machines when not in use. Looking at th the images, it's easy to "feel" the construction: plastic-foamy, soft but smooth and clean, with living hinges that are easy to fold. It's the kind of thing that would put a smile on your face every time you use it - and some more usable space when you don't.